If users in your NAV installation does not have personal license, the system may they run out of shared licenses. A common question is then who is it that has not logged out? Dynamics NAV is available in several licensing models, for example, where licensing models "perpetual licensing" means Listed users share a pool of concurrent user licenses. This means that there may be more users Listed in the system than what can log in simultaneously. If all seats are occupied Listed users can not log into the before another first logged out. The only problem is that it can be difficult to know who is logged in and takes up a place. To find out, you must be logged in as a superuser. At the top right of the search box, type in "Sessions". 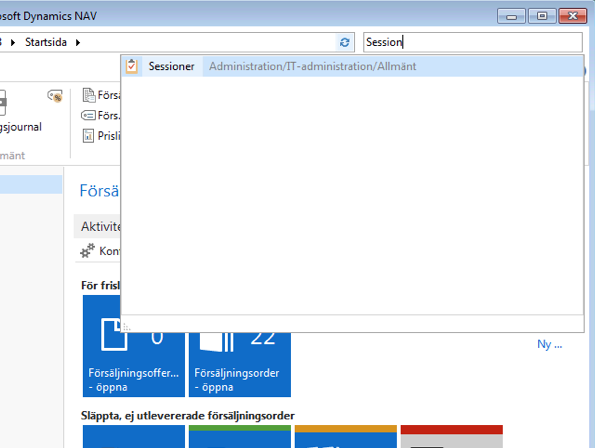 Select Session list and the window with sessions appear. In the list of sessions, you can then see which users logged on and how long they had been there. To free a license, you can then ask one of the users in the list to close its NAV client and thereby conclude its session. If you do not get a hold of the user to shut down the session, it requires that you ask an administrator to end the session through the server. The system can also be customized with an "Terminate Session" function inserted in the session list. Alternatively, a routine is created that automatically logs out users who have been inactive for a long time.